Hope In Today Ministries Inc - HOW TO OVERCOME EVIL! Do not be overcome by evil, but overcome evil by good! I have also heard it good to say to, and, also hear from our loved ones whose goal is to help us in Christ, “I am not your enemy” ... husbands and wives are not each other's enemies, not are parents and children each others enemies. None of us are perfect -we are all growing up on one level or another! And, in our experience, there are those in this world that are our brothers and sisters in Christ, but they are not acting according to God's Way ...God's command to us is to love our neighbor as He has loved us! “Whoever believes in Me, as the Scripture has said, out of his heart will flow rivers of living water (John 7:38).” Jesus is the living water! Who is our enemy? The Bible is our source to all knowledge! "Yet do not regard them as an enemy, but warn them as you would a fellow believer." So, who is your enemy? In one word, evil is your enemy. We see evil demonstrated in those who love evil, rejoice in evil and have no love, respect, mercy or compassion from God for people. Evil is the enemy of good. Weak character leaves much room for Satan to do his work through a person. So the Bible teaches, Build yourself up in your most holy faith and pray in the Holy Spirit. God is good; slow to anger and patient in His mercy and goodness that HE is not willing that any should perish, but that all would come to know His saving grace that comes to us through His Son who died once for all sin and rose again by the power of God's Grace, so that all who will believe shall inherit eternal LIFE. Not all people want to believe God; not all want to please God ... some people will reject God's gifts, but God IS willing to forgive those who will come to HIM! Yet, not all people want what God has to give ... Those who reject God's grace and choose selfish desires at any cost is the enemy we are to overcome! Don't change the NOUN! Change the VERB! The Bible says, do not BE overcome ... Think about that! As someone wrongs you, do not allow your emotions to rage; nor control your words or actions! We are a child of God, do not become like those who reject God's love and BE overcome by evil. We are free in Christ; BE free by GRACE! The Bible says, rather than be overcome ... OVERCOME evil with good! The action is of God is Good! The Power in God's Pure Love! The Purpose is in God's good Mercy! The instructions are to us to Pray! 29 But he that shall blaspheme against the Holy Ghost hath never forgiveness, but is in danger of eternal damnation ( Mark 3:28-29 KJV)." So, How do you overcome the real troubles in this world that do come from your enemy? God's way! In God's Power! By God's Grace, According to God's Word, by the power of the Holy Spirit! There is a peace that transcends ALL understanding...PEACE is the PRESENCE and POWER of God with us! HIS Name is Jesus who has made Peace available. Do you believe in God? Do you believe in the enemy, Satan who commands a force of evil spirits? Do you believe in Jesus? Do you believe in the Holy Spirit? Who will you follow? Not by mere might, but by the power of God, we overcome evil with good! The enemy of God delivers troubles to come at you and me, and to be against us in every way, with a purpose to get us to MOVE away from God's will for us in Christ. Please remember that Greater is God who is in you; and all who place faith in Jesus, by the grace given to you in your believing faith in God's Son ... Greater is HE, who is in you, than he that is in the world! The Bible says, "Do not be overcome by evil, but overcome evil with good." The Bible says to Abide in the Peace of Jesus, know when to walk away, know when speak, know when to be silent; and depend on the Holy Spirit as your constant help and your shield in all things. The Bible says IF your enemy is hungry, feed him; but what could be the source of your enemy's hunger the Bible talks about ...IF HE IS HUNGRY? The Holy Spirit revealed to me that IF your enemy is hungry, feed him with Holy Spirit flowing evidence in you of the living WORD: Evidence of JESUS living in you! DO THE RIGHT THING ACCORDING TO GOD's WILL! WWJD? Feed a HUNGRY enemy (desiring knowledge of God) in the power of Gods' love that God gave His Son for them! Perhaps the over-flowing of God's love in you that is toward them will be the power God uses to make the someone who has never known Christ before hungry to know this Jesus we know! If your enemy is thirsty, give him a drink! Does this mean literally a drink of water? A drink of water to a thirsty enemy would be evidence of compassion, which is of God! Romans Chapter 12:Verses…20"BUT IF YOUR ENEMY IS HUNGRY, FEED HIM, AND IF HE IS THIRSTY, GIVE HIM A DRINK; FOR IN SO DOING YOU WILL HEAP BURNING COALS ON HIS HEAD." 21Do not be overcome by evil, but overcome evil with good. I believe that this verse if for our own benefit of our relationship with God to remain pure in Christ. I wonder as I read these Scriptures if God will use our acts of love to reveal God's nature and character to those who are able to seek; or may be seeking. Follow my thoughts: We do NOT pray for Satan! Satan's doom is already proclaimed by God! WE are called to pray for those who are being lead astray however. The Bible says that Jesus is the Bread of Life and there is life in the blood of Jesus. There is a water that JESUS gives us that brings everlasting life! Whoever COMES to JESUS will never go hungry! Believing in Jesus -God will always provide for every lack and every need! Abiding in the flow of God's Spirit, we choose blessings! And, so we now can also see that this drink we give to person who is being devoured by the enemy of God is the power of Salvation that has come. This drink of kindness and unconditional care is evidence of God's Kingdom Come through Jesus Christ our Lord. IF a person is thirsty for God! The enemy is evil. Satan is the commander of evil spirits. God is All-knowing and powerful. Jesus has overcome evil. The Holy Spirit is our help and shield. But does the world know HIM? NO, but God is willing for all to come! We just have to represent Jesus well at all times; and trust God knows what HE is doing! Whoever BELIEVES in JESUS will never be thirsty! This message is for me! Our enemy has to be hungry for change! Our enemy has to want forgiveness. If our enemy is rejecting the love and forgiveness of God then that seed (of God's WORD) that we feed them falls on rocky soil as the Bible says; and there is a time to shake the dust off our feet and there is a time not to look back. Yet, always know that it is the Holy Spirit who does the work! BUT, IF our enemy is hungry FOR THE BREAD OF LIFE, we know what to do: FEED THEM AND GIVE THEM A DRINK! If God whispers, give him a hamburger ... then do so! If God whispers, be patient and kind, but stand firm with what is right, then do so. If God gives you a word to speak, then do so. If God says resist and pray, then resist and pray! God never leaves us in a lack of knowledge: OUR BREAD IS, The message of God's love for them through Jesus the Christ, the Son of the Living God, whom God sent for the world / and gave to the world to believe that God SO loved the world (SINNERS NEEDING HOPE) that HE gave His only begotten Son, that whosoever believes in God's Son, shall not perish but have everlasting life! The PURPOSE is for the world to see a way that is not of this world. God's Way! Romans Chapter 12 Verses Beginning with…17Never pay back evil for evil to anyone. Respect what is right in the sight of all men. 18If possible, so far as it depends on you, be at peace with all men. 19Never take your own revenge, beloved, but leave room for the wrath of God, for it is written, "VENGEANCE IS MINE, I WILL REPAY," says the Lord. God's word defines all things. We are not called to enable ..., but to overcome by good. The Bible explains all we need to know; and the Holy Spirit enables us to understand. I hope this is a blessing to you as well as me. It is our DEBT to love one another, because God 1st loved us. "Our Father who art in Heaven ... forgive us our debts, as we forgive those who debt against us and lead us NOT into temptation, but deliver us from evil. For Thine is the Kingdom and the Power and the Glory. Forevermore. Amen." We have a book that we would love for you to have. If you would like to receive your copy of THE TRAIN WHISTLE, SOUNDING the call of GOD's LOVE, write to me & (include your mailing address) to request your free gift today! karen@hopeintoday.com I will be happy to mail you your copy as evidence of God's love... Your life cost Jesus something, but God only asks you to believe. This book cost us something, but we ask only that you you believe! God's love is this wonderful! Our blessing is in grace of God alone! God bless you with Grace and Peace and rest in your faith that is found in your ability to trust in God! Tempted to give up HOPE? Make THE Trouble YOUR Testimony! Two feet in front of you, all you can see is a wall, but God sees the path to a great Call on your life! Take another look at that great wall standing seemingly fearlessly in front of you. David saw a giant, but he knew he stood with God and he had a stone! Look at your resources; do you have at least a stone to cast; or a word to speak in prayer? The Word of God is your way; and Jesus Christ is your Wisdom and Strength –allow the Holy Spirit to guide you with what God is providing! If you don't try to run away or go around your trouble, that wall will become your testimony with God for God's Glory Alone! Now don’t boast in tomorrow that you will do this or that; or make money or not, –according to Scripture, but...no matter what ... Where are you going to be in 3 years? What you do in the next 2 years decides where you will be in 3 years and tomorrow begins with our choices in Today. Not getting caught up in the dates, but where are you going to be in 3 days, the next 2 days decides where you will be in 3 days...and the same with tomorrow! Where we are tomorrow begins with our choices we make in Today! We need to make our choices with God. Focus on the real stuff, like God loves you and HE is faithful and true and just! We have all the hope we need for all that we may face Today –and God has tomorrow covered! The Bible says that there is enough trouble in tomorrow, so don’t worry about tomorrow in what you will eat or where you will be …paraphrased, but God is teaching us to be joyful always in Today for as long as God calls it Today! Many times it is difficult road learning, until we understand all that we are learning has a great purpose ~ more than college education! Never give up on the good things of God to follow the worldly passions to just drift away and do or say anything you feel like! We must battle through and resist temptations with a fight to rise to the top with God in all that we do! We must remain dedicated to remembering the HOPE that God had given us...as we remember that just because you may be in a difficult place in your life Today or tomorrow, it does not mean that you have to stay there! · God hopes –God believes in us; and HE gives us all we need! God hopes we will persevere through our test learning that God’s way is best for us! 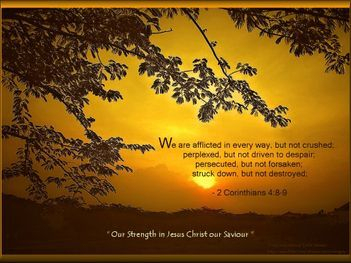 God knows we have everything we need in HIM to persevere; not only persevere, but we are equipped to persevere well with God’s strength peace and joy! Even when we don’t feel like being good; God knows we have faithful endurance available and God knows the reward for our benefit of learning this way! God's Word is our strength for Today! Each Today, until we get to our grand reward, God’s Word is our strength to endure all things with a brand new start! The Road to a Good Life! Test everything by the WORD of God. God's Spirit in you will agree and make you sure. The Bible says to test everything! God warns us to test everything! God is leading us to a good life in a world that is working to defeat us...God has nothing to hide and gives us the truth in a way that convicts our heart to know the right way...Faith! Faith is real, but it takes time to understand the vital importance of faith! Many people look for signs, but the Bible warns us of following signs! A sign can be just the thing that leads us down the wrong path! That is why we are to test everything for God's peace in it. When God leads us to it...HE will lead us through it! We can always trust God! And faith is a gift! Have you accepted your gifts from God yet? We have two choices in who to believe...and who to follow! And although it may seem like many, it boils down to following God or something else...we each have to make up our own mind how important it is to have God in our life. If you thought about who watches over your life, who would you say? Are you really in control of your life security and finances today? What about tomorrow? Really, our day is today to follow Jesus, because tomorrow as we know it is not guaranteed. Anything can change in a moment! God is never changing...HE is faithful and true! Could you say that you are faithful to GOD? Would you worry tomorrow if you lost your job or were put in the hospital? There is security found in God in all things! Narrow is the gate to follow God...it is easy and clear and offers hope, love, peace and eternal life...HIS name is JESUS. God's will for us is to be like HIS SON>>>tempted< but enabled to overcome sin and live a life in peace! Seek God and you will find HIM...ask God and you will receive...But it all starts with a believing heart...Ask God to help you in your every need.